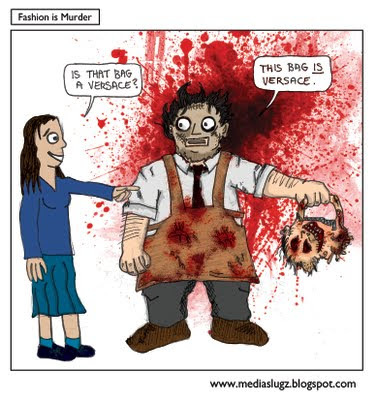 Ever wonder what Leatherface does with all those people he kills? Or why he's driven to kill in the first place? Well it's turns out that he does it to make people think. He's actually a life long member of PETA and a patron of the Arts. He has a vast body of thought provoking works, most of which is about man's cruelty to animals. He has created this bag from fashion designer Versace to make us all think about the exploitation and murder of animals just for something to carry our tampons and make up in. Personally I prefer his earlier work which included an inflatable life boat made from the skin of the survivors of the Titanic. You can wear them with white jeans and dark t-shirts on weekends, and if you are in heading to a beach, then boat shoes the perfect pairs to choose.